Many come to Anna Maria Island to relax on a beach chair and admire the pretty sunsets on the Gulf while indulging in that Old Florida charm. Perhaps no place is in the world is more idyllic when it comes to the calming water views and cascading colors over the horizon line. If you want to take a break from the breathtaking views, you can check out the local museums on and near Anna Maria Island. Step into any of the below museum stops to learn a unique aspect of the rich history of the region. The Ringling Campus in nearby Sarasota includes a large collective of attractions to see and museums to admire where you can easily spend several days exploring. The Ringling grounds features the inspiring Ca d’Zan, a breathtaking former seasonal castle residence of the circus’s founder John Ringling, resting against the Sarasota Bay. Walk the Ringling gardens for some quiet relaxation. Check out the Ringling Circus Museum, which collects circus artifacts from Ringling’s extensive history, including a large exhibit of a day in the life of a circus in minitures. The Art Museum collects art and pieces from around the world – a culmination of John and Mable Ringling’s far-reaching and global collection. This Bradenton Museum helps fill in some of the more historically-dense parts of Anna Maria Island’s legacy. The South Florida Museum covers the prehistoric to the present, offering valuable insight into the creatures that roamed AMI all those years ago and what brought us to present day in Florida. The aquarium here is a top attraction, with the popular manatee rehabilitation room. The Planetarium expands the scope, giving you the selection of three brilliant shows. Admission is $19 for both the museum and planetarium. This cozy little museum is conveniently located on the northern part of Anna Maria Island on Pine Ave. The museum offers various fascinating exhibits on the island’s history including the island’s original jailhouse, the historical Bella Haven home which is a classic 100 year old cottage, and the main icehouse. The icehouse was transformed into a memorial and treasure trove of local island history. The Anna Maria Island Historical Society has free admission. 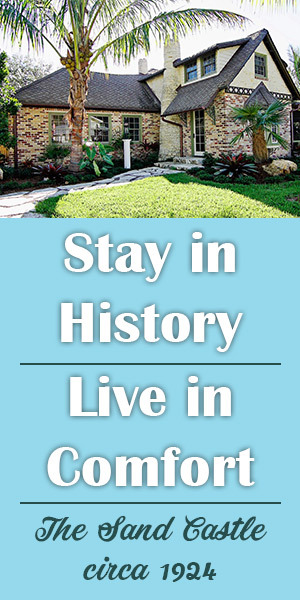 It is a delightful little stop as you learn a new side of Florida’s Gulf Coast history. We recommend you make time to explore this island gem!! The Florida Maritime Museum captures the historic fishing village of Cortez, right off Anna Maria Island. This enthralling and authentic Old Florida museum preserves the maritime heritage of the village and island with folk musical events, photography museum exhibitions and Folk School- a series of workshops and events for writing, cooking, painting, and instilling classic Florida art styles to a new generation. The De Soto National Memorial is located just a 15 minute drive from Anna Maria Island at the Riverview Point Preserve. It features a visitor’s center with stunning displays of historic period items, weapons and armor from the early 1500s. This was the period of time when Conquistador Hernando De Soto made landfall in Tampa Bay and met fierce resistance from the local Native Americans. There are plenty of things to do outdoors when you arrive here as well, including a picnic area, a nature trail exploring the local ecosystems, wildlife viewing areas, fishing events, and kayaking tours. The memorial is also pet friendly so bring your good boy or girl along but keep them leashed! These are the five best museums on and near Anna Maria Island, but there are even more to explore if you don’t mind a bit of driving from your Anna Maria vacation rental. The Florida Holocaust Museum is a riveting look at a dark history. This St. Petersburg museum features photographs, artifacts, and other rare items donated throughout its many years in the area. Tours are available. Or take a stop at the Tampa Museum of Art for a look at some bold and world-renowned pieces. No matter when you visit, you will always have lots of Anna Maria Island things to do, and museums are certainly among the best of them, with educational attractions, activities, shows, and genuine fun for all ages.